/ Remove link on repinned Pinterest photo? Remove link on repinned Pinterest photo? I repin photos and images all the time on Pinterest but sometimes the image is great but where it points isn’t so much. Spam, scams, or just horrible sites. Can I repin something without the site link remaining intact? Asking about whether you can repin something on Pinterest while removing information about the origin of the pin ends up being both a technical and ethical question, actually. It’s definitely something doable — worst case, you take a screen shot and repost it! — but whether it’s right or a possible copyright violation is another story entirely. From a user’s perspective, it’s also nice to know where to go for more information, but then again, I know exactly what you mean that there’s just some content on Pinterest where the photos are beautiful but lead to bad sites. What I don’t like about it is the “83 Unreal Places You Thought Only Existed In Your Imagination”. Too click-bait-y for me. 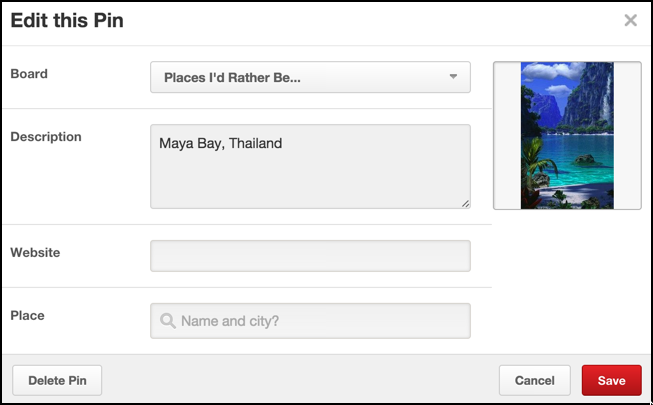 Clicking on the pencil icon adjacent to “Maya Bay, Thailand” lets me fine-tune the caption, but the link’s still intact, along with the title of the linked page (“83 Unreal Places…”), those can’t be tweaked from this point. Still, let’s proceed. 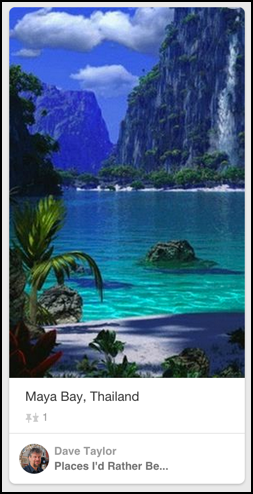 I’ll pick “Places I’d Rather Be…” as my target board for this repin, and click “Pin it”. Look back at the original image: when it’s not your Pin, the top right is the “like” heart icon. But since you now own this repin, it’s a pencil instead. Good. Click on it! Here’s where you can change what Board it’s on, update the description, tag a specific place if you’re so inclined, and… remove the URL link to the Website. That’s it. Photo repinned but underlying URL Website link removed. Oh, and follow me on Pinterest too, if you’d like: Dave Taylor on Pinterest. This no longer works. I am trying to change the link on one of my own pins, not a re-pin. When I edit the pin, the Website box is there, and I can remove or change the link, but when I click on the pin after saving the changes it still goes to the old link. I edit again to check, the Website box is empty, or has the new link, try again, still goes to the old link. Thank you for pointing out the ethical aspect of removing the originating website. Many, many artists have a lot of concern about their artwork appearing on Pinterest without appropriate acknowledgement of the artist who owns the copyright on the image. Pinners should always link when possible to the artist’s website or blog to allow the artist to get the benefit of any “click throughs” that occur.